Kevin Ware did the hardest part. Lying on the court in what had to be immeasurable pain, bone jutting out of the skin below his knee, Ware exhorted his Louisville basketball teammates to win the Midwest Regional in his absence. That moment of wherewithal ranks among the most amazing things I've seen in a sporting event. "Valiant" was the word Rick Pitino used to describe it, and that seems like a good one. But Pitino did his part Sunday, too. It might not have been valiant, per se, but it was leadership in action. The coach of the Cardinals handled a horrific situation the way a coach of young people should, using Ware's strength as a way to ground his players and get them to persevere through a situation that had them shaken, sickened and saddened. That might be because Pitino has a tragically vast amount of experience in dealing with sudden trauma. A compound leg fracture in mid-game, right in front of the bench, is far from the most jarring moment Pitino has endured. "I think 9/11 and losing a child were probably the two most difficult things in my life," Pitino said Sunday, when asked whether Ware's gruesome injury was his hardest moment as a coach. When the World Trade Towers fell on Sept. 11, 2001, Pitino's brother-in-law and best friend, Billy Minardi, was killed. Another brother-in-law was killed suddenly within that same year when he was struck by a taxi. And Providence's 1987 Final Four run was preceded by a state trooper pulling over the team bus after the Big East tournament so that Pitino could make a phone call and find out his infant son, Daniel, had died. There have been self-inflicted wounds as well: the Karen Sypher extortion scandal, and the hubris that led to taking the Boston Celtics job and failing spectacularly. Those were not life-and-death issues, but they cut deeply. So the man has been through a lot. There have been some cruel life lessons learned in Pitino's 60 years – cruel enough that Kevin Ware's grisly injury ranks down the list. Further down the list, below Ware, are some other basketball injuries that cost Pitino plenty. His Kentucky team would have won the national title in 1997 if star guard Derek Anderson hadn't blown out a knee in late January – even without him, the Wildcats advanced to the title game before losing in overtime to Arizona. A broken foot by Preston Knowles late in Louisville's 2011 first-round NCAA game against Morehead State turned a slight lead into a huge upset loss. Five season-ending knee injuries to three players – Ellis Myles, Rakeem Buckles and Mike Marra – compromised other recent Louisville seasons. Now, armed with the best team in the Final Four and a chance to make history as the first coach to win national titles at two different schools, Pitino has the Ware injury to work through. Ware's season statistics are unspectacular: 4.5 points, 1.8 rebounds, 1.1 steals, 0.8 assists per game. But for the last two months he has been a vital energizer off the bench, substituting at both guard spots for starters Peyton Siva and Russ Smith. There was the career-high 11 points against Oregon in the Sweet 16, the five assists against Colorado State in the round of 32, the key 3-pointers in wins against Syracuse in February and in the Big East tournament, the harassing defense against everyone. Take that away and Louisville's guard rotation is short, literally and figuratively. Siva and Smith are 6-foot jets who have occasionally struggled against taller guards – specifically Siva against Syracuse. Pitino played Ware 24 minutes against the Orange in the Carrier Dome because of Siva's travails – and a fourth meeting with Syracuse this season is possible Monday night for the national title. Beyond stature is the issue of stamina. Smith and Siva are extraordinarily conditioned athletes, but they're also asked to play like madmen. They pressure the ball relentlessly and push the pace manically. That's hard to do without a few breaks during a game. Without Ware, the only backup guard to speak of is junior walk-on Tim Henderson. He averages less than a point per game and has played fewer than 90 minutes all season. Henderson primarily exists as practice depth, with some blowout minutes and emergency appearances along the way. The Final Four is a bit of an awkward time to suddenly become a key contributor, so Pitino said Monday that small forwards Luke Hancock and Wayne Blackshear may see some time in the backcourt Saturday against Wichita State. "Tim Henderson is going to have to step up," Pitino said. "Probably going to move Luke Hancock into the backcourt a little bit. Maybe we'll move Wayne Blackshear defensively into the backcourt, apply some pressure. We're just going to have to mix up. We have a lot of front‑court depth, but we don't have a lot of back‑court depth. That's pretty much it." Pitino will be worrying in public about replacing Ware. He may also be worrying in private, but it's guaranteed that he will not take that worry into practice with his team. He will be in high-positive mode with the Cardinals all week. Pitino at this time of year is all about transmitting optimistic thoughts. It is the annual March/April message to his team: building self-esteem and projecting confidence. The harsh critiques of winter mistakes by his players usually are replaced by a positive message heading into the postseason. Pitino's take on Ware's health outlook is a natural extension of that mindset. Everything is going great, and will be great. Kevin Ware will be fine. Kevin Ware will be in Atlanta. Kevin Ware will be on the court in a Cardinal uniform again next season. 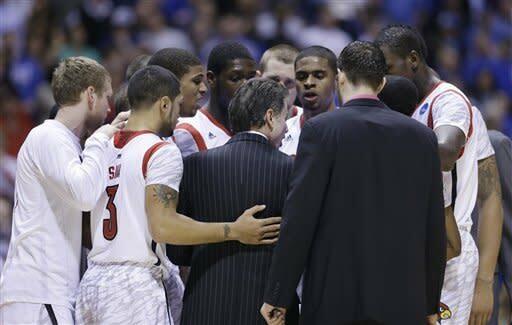 Rick Pitino has had a lot of experience dealing with sudden bad news – some of it a lot worse than a broken leg. The emotional scar tissue of his life lessons should help him and his team this week. More from Pat Forde on Kevin Ware's injury"